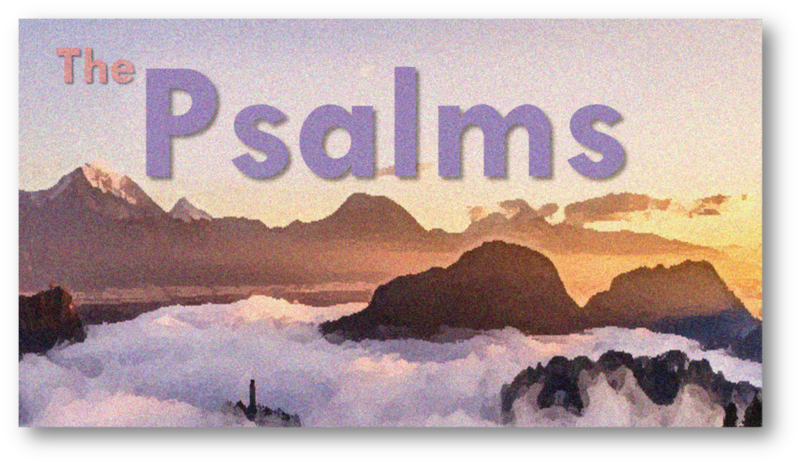 Read our Verse-by-Verse Commentary on the Psalms! Download a free mp3 teaching series from James HERE! The Hebrew title for this book (Tehillɩ̂m) can be literally translated as “praise songs.” The Greek translation (psalmoi) can be translated as “songs to the accompaniment of a stringed instrument.” The psalms are poetry, consisting of 150 songs for the people of Israel. While modern people listen to pop music, the Jews listened to and regularly sang the psalms. Why are the Psalms so important? First, the New Testament (NT) authors quote from the Psalms extensively. The NT cites the Psalms 116 times. (Isaiah is the only book cited more than the Psalms.) As followers of Christ, we should immerse ourselves in the book that Jesus and his disciples were absorbed in. Second, the Psalms teach us to have a heart for God. David wrote roughly half of the Psalms. In his writings, we see inside the soul of a “man after God’s own heart” (1 Sam. 13:14). The psalms are not dry theological treatises. Instead, these songs come from a place deep inside of David and the other psalmists. Readers discover the repetition of the psalms: praise, thanksgiving, God’s protection, God’s empowerment, etc. The reader might feel like this is boring at times. However, this shows what was really on David’s heart most of the time. He centered his prayers on God and his goodness. This also reveals to us what it means to be a “man after God’s own heart.” Praise was at the center—not around the periphery—of David’s relationship with God. In the psalms, we have the privilege of watching David wrestle with his sin and finding hope in the grace of God. Pastor Joe Focht points out that David was a much worse king and father after his moral fall into adultery and murder (2 Sam. 11-12), but he was a much better psalmist. After his fall, David understood the grace of God to far deeper degree. At the end of his life, David doesn’t see himself as a mighty warrior or as a powerful leader, but simply as the “sweet psalmist of Israel” (2 Sam. 23:1). Third, the psalms are our best commentaries on the Bible. Instead of jumping to extrabiblical commentaries (like the Talmud), we should read how the psalmists interpret Scripture. In addition to providing commentary, they also give us interlocking historical detail: Thirteen of the psalms tell us what David was thinking at key aspects in his life (Ps. 3, 7, 18, 34, 51, 52, 54, 56, 57, 59, 60, 63, 142). Fourth, the psalms teach us how to pray. They take us through the whole range of human emotion. Instead of giving us an instruction manual on how to pray, God gave us 150 inspired prayers. Instead of telling us how to pray, God chose to show us instead (cf. Lk. 11:1). Almost every psalm mentions giving praise to God. The Hebrew term “Hallelujah” comes from the root words hallal (“praise”) and jah or yah (“God”). Fifth, the psalms teach us how to balance HONESTY with FIDELITY. Roughly 40% of the psalms are lament psalms. Yet this doesn’t mean that the Psalms teach us to complain or have a poor attitude. Laments teach us how to pour out our emotions with honesty, but how to fight our despair by trusting the great promises of God. Laments start in sorrow, but they end in faith and hope. David wrote roughly half of the Psalms (73 total). David was a poet (2 Sam. 1:19-27; 3:33-34; 23:2-51), a musician (1 Sam. 16:18; 23; 2 Sam. 6:5; Amos 6:5), and he pushed for music in the Temple (1 Chron. 15:16-24; 16:7; 31; 25:1; Ezra 3:10). David was also a courageous and handsome warrior (1 Sam. 16:18). It’s challenging and encouraging to see the rich emotional life of such a strong, godly man. Descendants of Korah (42, 44-49, 84, 87-88). Heman the Ezrahite (Ps. 88). Ethan the Ezrahite (Ps. 89). “Orphan psalms” are those which are anonymous (34 psalms). Critics often deny the validity of these superscriptions—specifically those attributed to David. Consider a couple of arguments against the Davidic authorship of the Psalms. This doesn’t disqualify Davidic authorship, because many ancient kings wrote this way. Gleason Archer cites examples in Xenophon’s The Anabasis and Julius Caesar’s Gallic Wars. Archer even adds that Yahweh switches between the first person (“I am the LORD your God”) to the third person (“The LORD will not leave him unpunished who takes His name in vain”), even in the same chapter of Scripture (Ex. 20:2, 7). First, David could be using the term “temple” in a generic sense. The “temple” could just as easily refer to the “tabernacle,” which existed in David’s day. Archer writes, “Sanctuary (qōdeš) is used of the tabernacle in Ex. 28:43; house of the Lord (bēyt Yahweh) in Joshua 6:24; the house of God (bēyt Elôhɩ̂m) in Judg. 18:31; and even temple (hēyḵāl) in 1 Sam. 1:9; 3:3.” Furthermore, Archer notes that Psalm 27 mentions the “temple” (v.4) and the “house of the LORD,” but this same psalm calls this area the “tabernacle” and the “tent” (v.5). Second, David could’ve been anticipating the future dedication of the Temple by Solomon. God gave the instructions to build the Temple to David, and David knew the Temple was coming. It shouldn’t surprise us that he wrote music for its grand opening. David might have written these psalms because he was looking forward to the construction of the Temple more than anyone—even if it his songs were sung posthumously. We don’t have good reasons for denying the superscriptions of the manuscripts themselves. Therefore, we hold that David did write the Psalms attributed to him in the superscriptions. Furthermore, for those who believe in the inerrancy of Scripture, Jesus and the disciples affirmed Davidic authorship on numerous occasions (Mt. 22:45; Mk. 12:36; Acts 4:25-26; Acts 1:20; 2:25-28; 2:34; Rom. 4:6-8). The Jews collected poetry fairly early (Josh. 10:13; 2 Sam. 1:17-27). They recorded the Psalms during the Exodus (Ex. 15:1-18, 21), the Judges (Judg. 5:2-31), the Kings and Prophets (2 Sam. 1:19-27; 3:33-34; 22:2-51; 23:1-7; 1 Chron. 29:10-13; Isa. 5:1-7, 23:16; 26:1-6; 27:2-5; Hos. 6:1-3; Hab. 3) and at least to the time of the Exile (Ps. 137). Thus many authors wrote these songs over a thousand years. As we read the psalms, we intermittently read the word selah. But how should we translate this word? Like most scholars, Bruce Waltke says that this word cannot be translated. It would be sort of like translating “hip, hip, hooray!” Waltke says it can be loosely translated as praise—that is, focusing our minds on “ascent” or looking up to God. Pastor Joe Focht understands this term as, “What do you think about that?” In other words, these portions of the psalms encourage us to pause, meditate, and reflect on the message for a moment, as the musical interlude plays in the background. Bruce Waltke’s 18 week class on the Psalms found here. Lee Campbell’s 5 week class on the Psalms found here. Pastor Joe Focht of Calvary Chapel Philadelphia teaches verse by verse through the entire psalms (found here). Willem A. VanGemeren, Psalms: The Expositor’s Bible Commentary (Vol. 5, Grand Rapids, MI: Zondervan Publishing House, 1991). C.S. Lewis, Reflections on the Psalms (New York: Harvest Book; Houghton Mifflin, 1958). Lewis’ book is a topical reading of the psalms, breaking up the various topics into categories. As usual, Lewis offers clever and thoughtful insights into his topic. However, chapter 11 (“Scripture”) is a particularly disagreeable chapter. Lewis denies the historicity of Job (pp.109-110). He believed that the story of creation could’ve been told and retold until it reached its final state in the book of Genesis. He writes, “When a series of such re-tellings turns a creation story which at first had almost no religious or metaphysical significance into a story which achieves the idea of true Creation and of a transcendent Creator (as Genesis does), then nothing will make me believe that some of the re-tellers, or some one of them, has not been guided by God” (p.110-111). He doesn’t hold to inerrancy or verbal plenary inspiration: “The human qualities of the raw materials show through. Naivety, error, contradiction, even (as in the cursing Psalms) wickedness are not removed. The total result is not ‘the Word of God’ in the sense that every passage, in itself, gives impeccable impeccable science or history. It carries the Word of God; and we (under grace, with attention to tradition and to interpreters wiser than ourselves, and with the use of such intelligence and learning as we may have) receive that word from it not by using it as an encyclopedia or an encyclical but by steeping ourselves in its tone or temper and so learning its overall message” (pp.111-112). He refers to the imprecatory psalms as “all the horrible distortions of the human medium” (p.114). Chapter 12 purports an allegorical interpretation of the psalms. For instance, Lewis states that the dashing of the babies’ heads against the rock (Ps. 137) could be understood to killing our sinful tendencies in their infancy (p.136). Roughly 5o of the psalms are in the “lament” genre (3, 4, 5, 7, 9, 10, 13, 14, 53, 17, 22, 25, 26, 27, 28, 31, 35, 39, 40, 41, 42, 43, 52, 53, 54, 55, 56, 57, 59, 61, 64, 69, 70, 71, 77, 86, 88, 89, 109, 120, 139, 140, 141, 142). Psalms of lament are those that show the psalmist bearing his sorrow, pain, and heart to God. As we read these, we are often shocked at how honest the psalmist is with God. These often seem at first glance to be too honest! The psalmist turns to God, rather than to a necromancer or an idol. He explains why he’s lamenting. He asserts his confidence in God. DISCUSSION QUESTION: What is the difference between being honest with God in prayer, and having an infantile and ungrateful attitude? Is there anything that should NEVER be prayed to God? My friend Lee Campbell teaches that we should keep a balance between honesty and fidelity with God. It is appropriate to start by telling God about our feelings. But we shouldn’t end our prayer session with an ungrateful attitude. Note that most of the lament psalms end with praise. We need to remember that giving thanks is for our benefit, and it is the cure for anxiety, grief, and sadness (Phil. 4:6-7). Psalms of thanksgiving emphasize our need to express gratitude. According to the NT, it’s reasonable to give thanks (1 Tim. 4:3-4) for God’s kingdom (Heb. 12:28; 13:5). We are actually commanded to give thanks (Phil. 4:4-13; Ps. 95:2; 107:1; 1 Chron. 16:8; 1 Thess. 5:18; Col. 3:15; Heb. 12:28). We often don’t think of ingratitude as rebellion. However, this is actually a hallmark of the moral and spiritual insanity which occurs at the end of history (2 Tim. 3:1-5). The bedrock sin is to refuse to honor and thank God. Paul writes, “For even though they knew God, they did not honor Him as God or give thanks, but they became futile in their speculations, and their foolish heart was darkened. 22 Professing to be wise, they became fools” (Rom. 1:21-22). Refusing to give thanks has a poisoning effect on the mind. Thanksgiving gives us insight into God’s salvation. The psalmist writes, “He who offers a sacrifice of thanksgiving honors Me; and to him who orders his way aright I shall show the salvation of God” (Ps. 50:23). In his class on the psalms, my friend Lee Campbell notes that he loves his wife the most when he sits down to write a love letter for her. It’s in reflecting on her that he realizes how much he loves her. Of course, nothing about this exercise changes his wife. She didn’t change. He changed! Similarly, when we reflect on the goodness and love of God, this has a transforming effect on us. (Ps. 4:7) You have filled my heart with greater joy than when their grain and new wine abound. (Ps. 20:7) Some boast in chariots and some in horses, but we will boast in the name of the Lord, our God. (Ps. 25:3) Indeed, none of those who wait for You will be ashamed. (Ps. 27:4) One thing I have asked from the Lord, that I shall seek: that I may dwell in the house of the Lord all the days of my life, to behold the beauty of the Lord and to meditate in His temple. (Ps. 30:5) His anger lasts only a moment, but his favor lasts a lifetime; weeping may remain for a night, but rejoicing comes in the morning. (Ps. 31:19) How great is your goodness, which you have stored up for those who fear you, which you bestow in the sight of men on those who take refuge in you. (Ps. 33:10-11) The Lord foils the plans of the nations; he thwarts the purposes of the peoples. 11 But the plans of the Lord stand firm forever, the purposes of his heart through all generations. (Ps. 34:18) The Lord is close to the brokenhearted and saves those who are crushed in spirit. (Ps. 36:8) They drink their fill of the abundance of Your house; and You give them to drink of the river of Your delights. (Ps. 37:7) Be still before the Lord and wait patiently for him; do not fret when men succeed in their ways, when they carry out their wicked schemes. (Ps. 37:16) Better the little that the righteous have than the wealth of many wicked. (Ps. 46:10) Be still, and know that I am God; I will be exalted among the nations, I will be exalted in the earth. (Ps. 49:20) A man who has riches without understanding is like the beasts that perish. (Ps. 50:12) If I were hungry I would not tell you, for the world is Mine, and all it contains. (Ps. 55:22) Cast your cares on the Lord and he will sustain you; he will never let the righteous fall. (Ps. 60:11 NIV) Give us aid against the enemy, for the help of man is worthless. (Ps. 62:1) My soul waits in silence for God only; from Him is my salvation. (Ps. 68:5) A father to the fatherless, a defender of widows, is God in his holy dwelling. (Ps. 84:1-2) How lovely are Your dwelling places, O Lord of hosts! 2 My soul longed and even yearned for the courts of the Lord; My heart and my flesh sing for joy to the living God. (Ps. 84:10) Better is one day in your courts than a thousand elsewhere; I would rather be a doorkeeper in the house of my God than dwell in the tents of the wicked. (Ps. 90:12) Teach us to number our days aright, that we may gain a heart of wisdom. (Ps. 94:19) When anxiety was great within me, your consolation brought joy to my soul. (Ps. 103:12-13) As far as the east is from the west, so far has he removed our transgressions from us. 13 As a father has compassion on his children, so the Lord has compassion on those who fear him. (Ps. 111:2) Great are the works of the Lord; they are pondered by all who delight in them. (Ps. 111:7) The works of his hands are faithful and just; all his precepts are trustworthy. (Ps. 116:15) Precious in the sight of the Lord is the death of his saints. (Ps. 118:6) The Lord is with me; I will not be afraid. What can man do to me? (Ps. 118:8) It is better to take refuge in the Lord than to trust in man. (Ps. 119:14) I rejoice in following your statutes as one rejoices in great riches. (Ps. 119:18) Open my eyes that I may see wonderful things in your law. (Ps. 119:27) Let me understand the teaching of your precepts; then I will meditate on your wonders. (Ps. 119:32) I run in the path of your commands, for you have set my heart free. (Ps. 119:50) My comfort in my suffering is this: Your promise preserves my life. (Ps. 119:71) It was good for me to be afflicted so that I might learn your decrees. (Ps. 119:99) I have more insight than all my teachers, for I meditate on your statutes. (Ps. 119:102) I have not departed from your laws, for you yourself have taught me. (Ps. 119:105) Your word is a lamp to my feet and a light for my path. (Ps. 119:160) All your words are true; all your righteous laws are eternal. (Ps. 120:7) I am a man of peace; but when I speak, they are for war. (Ps. 127:1) Unless the Lord builds the house, its builders labor in vain. (Ps. 130:3-4) If you, O Lord, kept a record of sins, O Lord, who could stand? 4 But with you there is forgiveness; therefore you are feared. (Ps. 139:4) Before a word is on my tongue you know it completely, O Lord. (Ps. 139:16) Your eyes saw my unformed body. All the days ordained for me were written in your book before one of them came to be. (Ps. 139:17-18) How precious to me are your thoughts, O God! How vast is the sum of them! 18 Were I to count them, they would outnumber the grains of sand. When I awake, I am still with you. (Ps. 139:23-24) Search me, O God, and know my heart; test me and know my anxious thoughts. 24 See if there is any offensive way in me, and lead me in the way everlasting. (Ps. 140:12) I know that the Lord secures justice for the poor and upholds the cause of the needy. (Ps. 143:10) Teach me to do your will, for you are my God; may your good Spirit lead me on level ground. (Ps. 144:3-4) O Lord, what is man that you care for him, the son of man that you think of him? 4 Man is like a breath; his days are like a fleeting shadow. (Ps. 145:18-19) The Lord is near to all who call on him, to all who call on him in truth. 19 He fulfills the desires of those who fear him; he hears their cry and saves them. (Ps. 147:11) The Lord delights in those who fear him, who put their hope in his unfailing love. Gleason Archer, A Survey of Old Testament Introduction (3rd. ed., Chicago: Moody Press, 1994), 487. Kidner, Derek. Psalms 1–72: an introduction and commentary (Vol. 15). Downers Grove, IL: InterVarsity Press. 1973. 48. Gleason Archer, A Survey of Old Testament Introduction (3rd. ed., Chicago: Moody Press, 1994), 488. Gleason Archer, A Survey of Old Testament Introduction (3rd. ed., Chicago: Moody Press, 1994), 489. Gleason Archer, A Survey of Old Testament Introduction (3rd. ed., Chicago: Moody Press, 1994), 499. Achtemeier, P. J., Harper & Row and Society of Biblical Literature. (1985). In Harper’s Bible dictionary (1st ed., p. 922). San Francisco: Harper & Row.